Cards that senses the presence of a train on the track by the train's current consumption. The card is connected to the track by a track feeding lead going through the hole in one of the transformers on the card. The construction gives minimal voltage drop for track feeding. The card has sockets for two tracks. The outputs on the card is connected to the inputs of the decoders Servo5 or Signal10. The sensitivity can be adjusted by the number of turns that lead is drawn through the transformer, several turns give sensitive indication. If it passes once the indicated current is around 3mA. The level of the indicated current can also be fine-tuned by settings on the card. 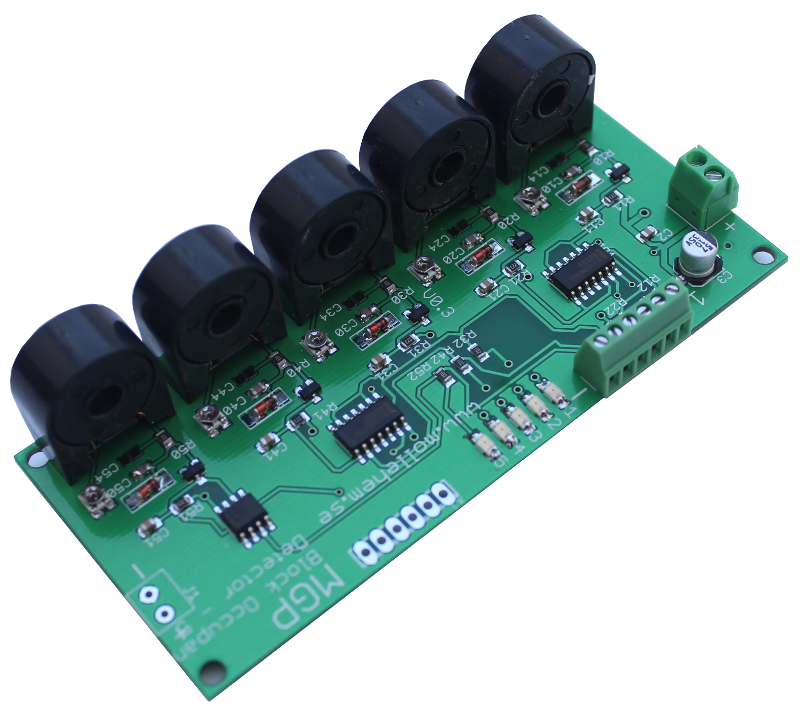 The card must be fed with 5-12DC (5 volts when used with MGP decoders). This can be taken from the connected decoder. Outputs the decoder is typically 0/5 volts when used with MGPS decoders. It is also possible to use so-called "Open collector" when connected to other cards. Instruction is here (at the moment only in swedish). Detector Occupancy detector 8, "Diode"